Host A Scentsy Party & Earn Half-Price & Free Scentsy Products! There are a few different ways to party with Scentsy – all giving you the opportunity to earn half-price items and product credit! You gather all your friends and family, ask them to bring a bottle and we bring Scentsy to you! 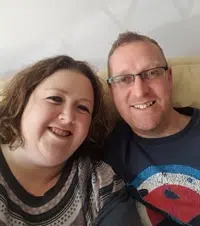 The Scentsy fragrances are designed to evoke memories and it is great fun to hear people’s stories and memories that are triggered by the fragrance testers! If someone can’t attend your party, but would still like to order from Scentsy then you can simply take their order before your party and this can be included towards your Scentsy hostess rewards! 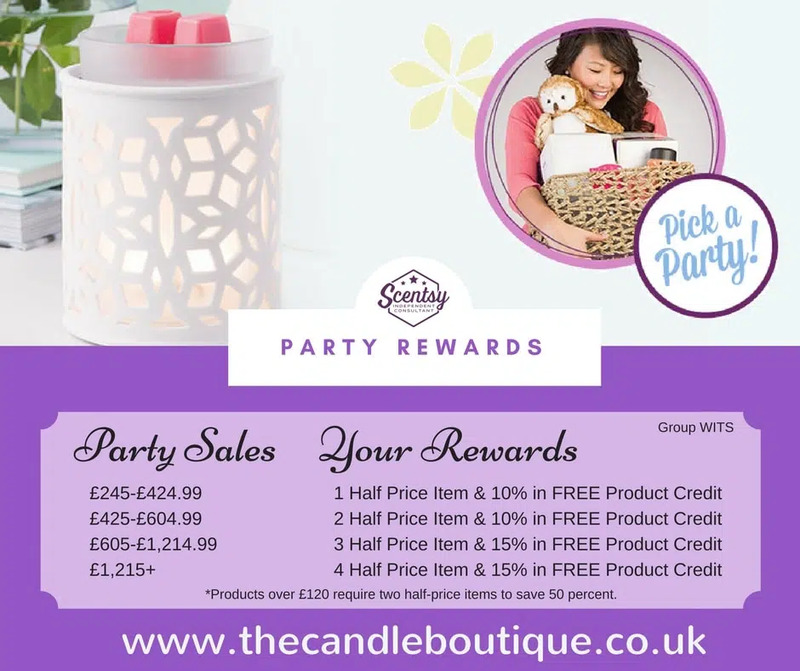 An example of your hostess rewards is if your party’s order reaches the value of £245.00, you will receive one half-price item and £24.50 Scentsy product credit. If one of your guests then books a party of their own, for attending that party you will also receive an additional half-price item!! A basket party is a great alternative to a conventional party if you have trouble getting all your friends and family in one place at the same time! We will send to you a warmer, some cubes to warm, some fragrance testers, one of our gorgeous Scentsy Buddy toys, together with some catalogues and order forms. You can borrow these for 7 to 10 days and in this time you can show your friends and family and collect their orders. You will receive all the same hostess party rewards as if you had held a conventional party. Another alternative is we would simply send you some catalogues, order forms and some cubes of our wax. Again, you would receive all the usual hostess rewards. This party is perfect for taking into work or simply delivering to friends and family if you do not have the time to demonstrate the warmer. The easiest party you've ever thrown. When you sign up to host a Scentsy Party, you get access to the Party Assistant, an online tool that will help you put all the pieces together. It's like having a temporary website where you can access everything you'll need to manage your party. From this site, you can view videos and see examples of various kinds of Scentsy parties in progress. You can also generate all sorts of emails, from 'Invite' and 'Party Reminder' emails to 'Thank You' and 'Sorry I Missed You' emails. Guests who aren't able to attend the 'live' party will be able to place their orders through this site. You'll be able to track those orders as they come in and begin to calculate your Host Rewards—the free and half-price items you can earn, based on the sales from your party. All of the above can be done through the Party Assistant. It really does make the whole process very easy. But that's not all. As your Consultant, I will be there for you every step of the way. By working together and taking advantage of the convenient tools that Scentsy provides, we'll make sure yours is the best party ever! Contact me to Schedule a Party Now! It's so simple. Your Host Rewards are based on the sales amount of products sold at your party, inclusive of VAT and exclusive of shipping charges that may apply. Don't worry if everyone you've invited can't make it—any orders you collect in advance still count toward your Host Rewards. Just refer to the chart below to see exactly what you can earn—then start making your Scentsy wish list! And it gets better! For every guest at your Scentsy Party who in turn books their own Scentsy Party, you receive one additional half-price item when you attend their party. It's just our way of saying 'thanks'. If guest orders at your Scentsy party total £ 605, you would earn £ 90.75 (15%) in FREE Scentsy products, as well as three items at half price. If guest orders at your Scentsy Party total £ 300, you would earn £ 30 (10%) in FREE Scentsy products, as well as one item at half price. If two guests at your Scentsy Party book their own Scentsy Parties and you attend them, you get two additional half-price items. As you can see, there are so many ways to earn yourself free and half-price Scentsy, so contact me today and we can get your party started! See how happy she looks? That could be YOU! Contact Me To Schedule A Party!